The last few years have seen extraordinary advances in so many areas of the building and construction industry, with factors like mobile capability, robotics, augmented and virtual reality, AI and three-dimensional printing all having a profound impact on the way the industry works. There has also been technology developed to address various issues encountered by those in the industry – document control, for example or incident management. But this piecemeal approach leads to disjointed systems that don’t talk to each other, resulting in data silos and further obstacles to productivity. Not only this, it also causes roadblocks on the path to collaboration and prevents companies from being able to draw comprehensive pictures of project health and status. The construction industry is one of the largest sectors of the global economy, employing about seven percent of the world’s working age population and accounting for an expenditure of around US$10 trillion. This may seem like a huge amount of money, but the sector’s labour productivity growth has been slow for decades. A recent McKinsey report revealed that if the sector’s productivity were to catch up with that of the total economy, that figure could rise by US$1.6 trillion. How much is a trillion? It’s a thousand billion. Or a one followed by 12 (count them!) zeroes. In the simplest terms, we’re talking about boosting the global GDP (gross domestic product) by two percent. What is holding the industry back? Experts believe that it’s a case of not catching up quickly enough. Yes, the industry is moving away from the manual inputs and paper-based documents of days of yore, but the technical solutions being implemented instead haven’t evolved sufficiently to really add value, winding up in inconsistent data and lags in productivity. Do any of the following sound like familiar issues in your company? fear of losing information, or a lack of confidence in the information available. Single point solutions make tools cumbersome to use and leave gaps in the tasks at hand. Companies are then forced to conjure up workarounds or implement additional software solutions to plug these gaps, resulting in a patchwork of internal servers, files and emails. This is not sustainable, streamlined or productive. Other industries have already discovered ways to work smarter not harder. While the productivity gains in the construction industry have grown just one percent over the last two decades, industries such as manufacturing have more than tripled that, with a 3.6 percent growth rate. Back to the dollars and cents (or sense? ), the average worker in every other industry now adds US$37 worth of value for every hour worked, US$12 more per hour than workers in the construction industry. The problem at its most fundamental lies in the communication between the site and the office, the people in the suits making the decisions and those getting their hands dirty at the coalface. What is needed is technology that consolidates information and is able to integrate real-time data to increase both visibility and collaboration. And the result? Much greater productivity. This technology needs to be a single across-the-board solution, with robust mobile capabilities and ease of access. 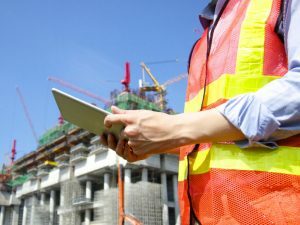 It is vital that it works for purpose – a platform type of technology that suits all of the functions and stages across a construction project’s life cycle – from project management to HSEQ to financials and beyond. Once the data is centralised, and streamlined and standardised processes are put in place, communication will become clearer, more consistent and, certainly, more effective. More effective communication between teams and also between them and their clients means more efficient project management and a dramatic improvement in not only productivity but staff morale and pride in their work. It’s a win/win all round. the average reduction of administrative work reported by users is two hours. The prediction is that Australia and New Zealand will both experience huge growth in the construction sector in the coming years – thanks to population rises and the necessity of building the housing and infrastructure to accommodate that. To fully take advantage of these opportunities construction companies need to have the sharpest tools in the toolbox at their command. Content provided by experts at Procore.